I had a conversation with an old friend not long ago, who was soon to celebrate his 67th wedding anniversary. I had to ask the obvious question: “How in the world did you and your wife do it? What is the key to a successful marriage?” He gave me a perfect, yet simple, vision of how self-sacrifice looks. He told me that every day he takes his wife out for ice cream, not because he likes it, as a matter of fact he said it irritates his throat. "I do it because I know she loves it.” Therein lies true sacrifice and commitment; love is as love does. You put the right ingredients into your marriage, you get the right results out. Few believe that, but it's God's immutable law of Giving equals Receiving. It works with a mathematical precision every single time. There is never an occurrence where we make a loving and meaningful investment into the lives of our spouses without receiving it back in manifold portion. There will be many times in your marriage when you will have to put the needs of your spouse before your own. Keep your eyes open to the fact that this is a blessing that God has given you. I guarantee that you will have an experience in your future where you will see that God was setting you up to reap a wonderful blessing. This blessing will come from your spouse when you need it the most. Spend your time concentrating more on learning to recognize opportunities like this and less time on whatever shortcomings your mate may have. In order to build a strong foundation for any relationship, you must be willing to see yourself as the conduit by which God can demonstrate His love to your mate. Marriage and your relationship with God is sometimes a delicate dance. As a single person, your focus was on building a relationship with Jesus Christ. Now, you must reprioritize your time with your partner. Remember, your spouse is not meant to be your everything; only God deserves and expects that place in your heart and mind. Your spouse is your mate, companion, help, lover, and friend. Once it was just you and God. He lavished all that love and caring upon you through His son, Jesus Christ. Now it's time for you to lavish it on your spouse, and to give it out as unconditionally as it was given to you. Build the marital relationship together on the solid ground of Christ. Be committed to reflect the example of Christ in your marriage. This is a sure way to the pathway to marital bliss. 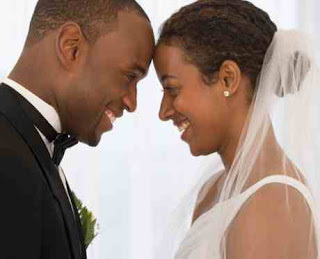 Heavenly Father, I seek your forgiveness for not holding up my end of the bargain in my marriage. It's a true gift. I realize that, and I thank you for it. I also thank you for the awesome privilege to minister in love and in truth to my spouse. I pray that my mate will see You bigger because of the love of Jesus Christ at work within me. In the powerful name of Jesus Christ, Amen.